Murano is a small set of islands just under a mile north of Venice and little under a mile across, only supporting a population of 5,000 people. Yet this small island in the Venetian Lagoon was one of the focal points of the Venetian glass industry, and continues to hold relevance to this day, focusing on their specialist craftsmen and the unique features of their glass. The history starts back in 1291, where the Venetian Republic moved their foundries to Murano, due the fact that the cities mostly wooden buildings were extremely vulnerable to the fire risk the foundries posed. Soon after, Murano’s most important people were laced with glassmakers as the important and skilful craft meant these people rose through the social ranks. Buy the 1300’s this social rank became official, with glassmakers being allowed to wear swords, immunity from prosecution from the Venetian state and a surprising amount of glassmaker’s daughters being married into important Venetian families. Needless to say this social status wasn’t without reason; these glassmakers were extremely skilled individuals and their products were vital to the trade based Venetian Republic. The beautiful designs used and maintained in modern Murano glass products are a reflection of the technology available to these craftsmen at the time. Since a method to harden the glass enough to cut it on a wheel had not yet been discovered yet the shape of the glass was completely based on how the glassmaker could manipulate it in the small amount of time between the glass being molten and it hardening. This can clearly be seen in the designs of the glasswork, long flowing arms of glass with few to no hard edges or flat surfaces. Even today, when the technology is there the style and techniques remain the same, leading to surprising modern looking designs born from a lack of technology over five decades ago! On the other hand Murano managed to develop and refine many other advanced glassmaking technologies. This includes, but is by no means limited to, enamelled glass, crystalline glass, galls with gold threads (or aventurine glass, for its correct name), multicoloured glass, milk glass and imitation gemstones, made again from glass. 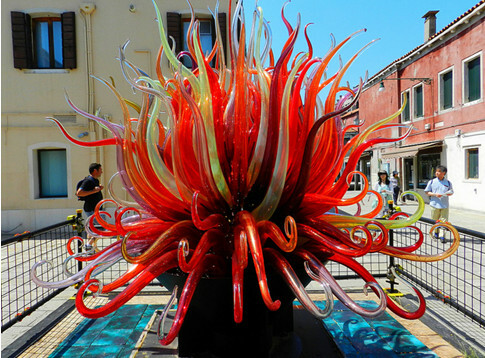 Some of these can be clearly seen in modern Murano glassmaking, such as the bright and colourful designs allowed through multicoloured and aventurine glass. 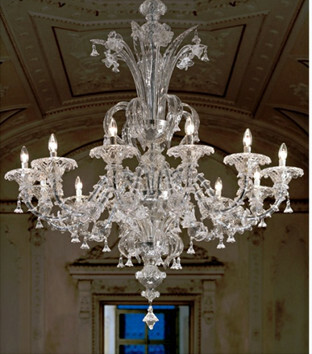 Of course, nothing lasts forever and Murano’s monopoly on the European glass industry is no exception. Despite the Venetian Republics efforts to keep the secrets of the glassmaking within its borders by forbidding the glassmakers to leave the state, some managed to escape and eventually spread the secrets throughout Europe. The spread of these secrets towards the end of the 16th century really marks the end of Murano’s golden age of glassmaking and whilst they still manage to maintain some of the industry it’s a mere shadow of its former glory, limited to a few skilled individuals and small companies, some of which having existed since Murano’s peak before the 17th century, making these companies some of the oldest there are. In any case, their experience shows and Murano do still manage to make some of the most intricate and beautiful pieces of glasswork there are. So amazing and beautiful chandeliers! I love unusual and interesting items like these! Thanks a lot for sharing this article!